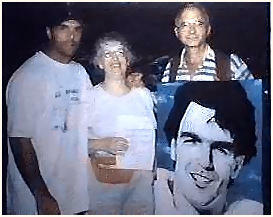 Doug Flutie with Ron Price who purchased All-American Flutie at auction for Doug's son's Autism Foundation, 1999. 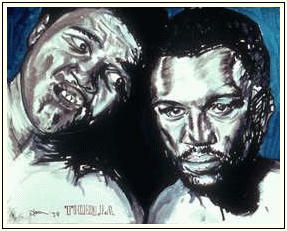 We were told Joe Frazier doesn't (didn't) sign original artwork. 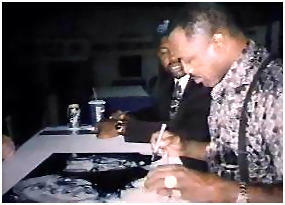 Here's Smokin' Joe autographing what is now one of our most valuable and rare pieces (signed by Ali as well!),THRILLA! 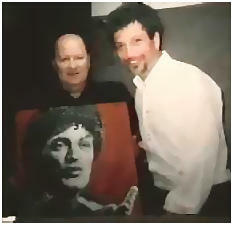 Our man Jim met with madman Howie Mandel backstage at his talk show in CA, presenting him with this portrait for autographing early in '99. 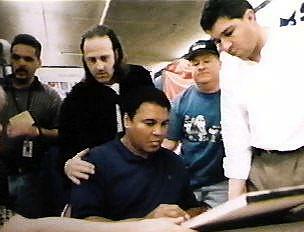 Word was Howie was extremely enthusiastic, and rounded everybody up for a viewing. 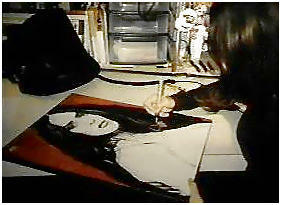 Ravishing film actress Salma Hyek signs another Bloom portrait to be auctioned off for charitable reasons. 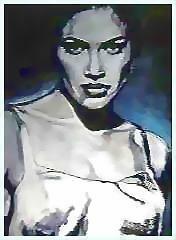 Art to make the world a better place. Even super�novas like Jennifer Lopez know it's cool to sign a Bloom Original! 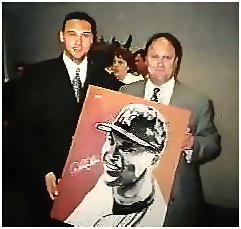 Yankee Mega�star Derek Jeter and Mega�manager Jon Feinberg pose with the portrait and Derek�s still�wet signature. 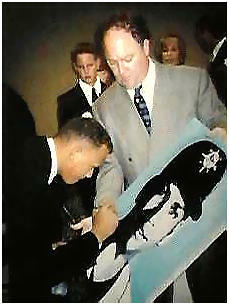 Another potential future Cooperstown initiate, Alex �Arod� Rodriguez lends us an extremely valuable autograph. 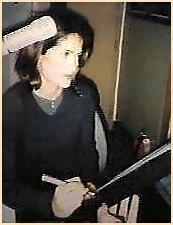 Yet another Feinberg coup! 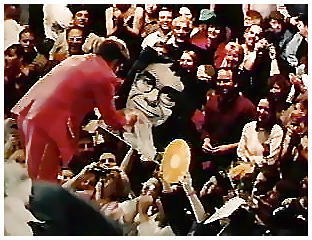 Elton is seen here just having signed UPCLOSE, and is handing it back to Jim, amongst the delight and roar of the fine-art-loving crowd. Our Jimmy gets around!